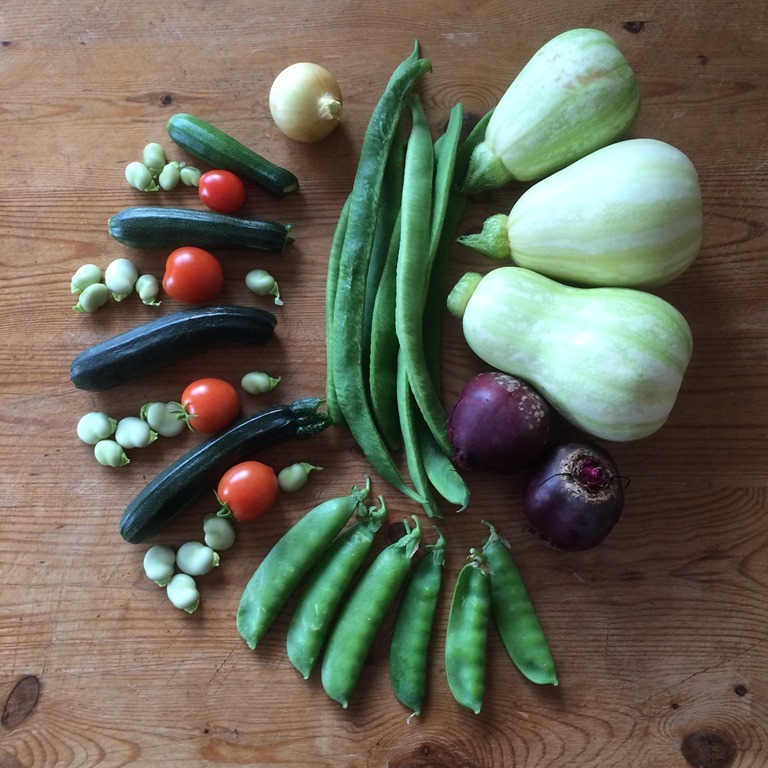 I’ve come to the end of my first calendar year as an allotmenteer and it’s been life changing, I expected to enjoy growing my own food, but it turned out that there were lots of benefits that I really didn’t expect to get from the allotment: the wonderful sense of community, the opportunity for continuous experimentation and learning, the amazing satisfaction from visible daily progress, the joy of sharing surpluses with others, the anticipation from planning next years crops, the taste of freshly picked food, the seemingly endless opportunity for little DIY projects and most importantly the rich sense of purpose it provides. Here’s a summary of my year. 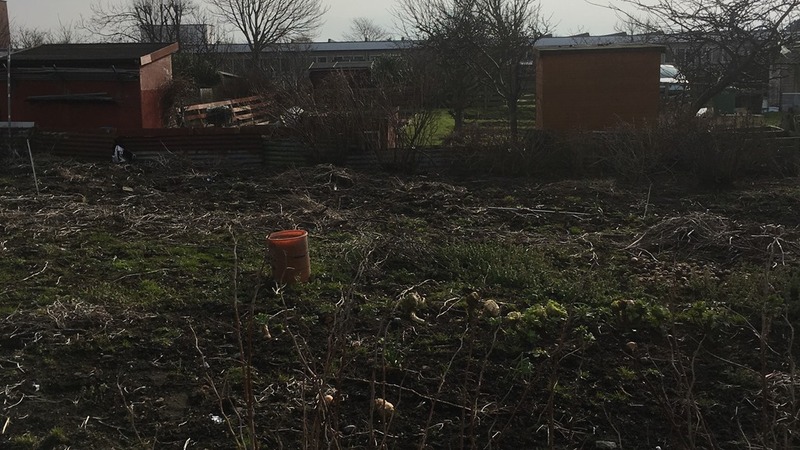 After a 6 month wait I was delighted to be allocated a plot on Shepherd Road Allotments in March and with the growing season not far away I didn’t waste much time sorting it out. I was fairly lucky to inherit a blank canvas plot that had been well worked for many years, only slightly neglected and with just a few challenges. The ground was infested with bind weed, mares tail and nettles with plenty of other weeds thrown in, as well as dozens of barrow loads of rocks, broken glass, rotting wood, rotten apples and potatoes. The first week was spent building compost bins and clearing the ground and with help from Jon this was back breaking but fun. We were encouraged by Jennie, fuelled by hot chicken and beef sandwiches from the nearby Booths cafe and buoyed on by sunny days throughout March. Once the ground was cleared we moved all of the existing fruit bushes to the perimeter of the site, repaired the shed and then the work really started. level the site, as it was initially on a slope and that meant it was flooding the plot next door and also losing it’s own precious water. 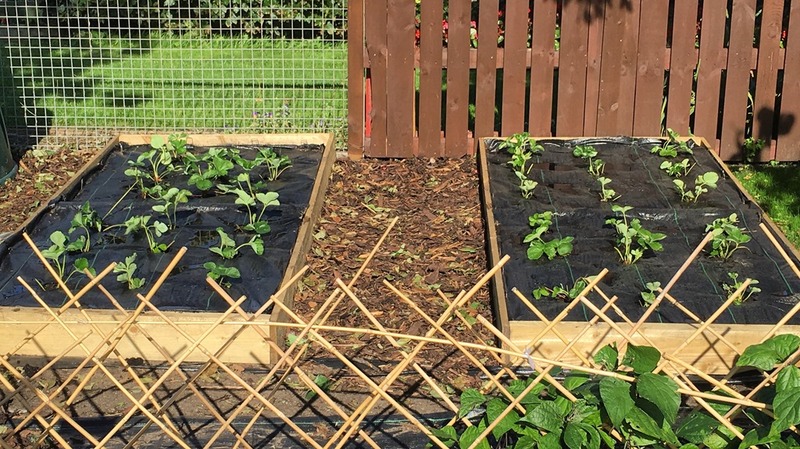 I was also planning to install raised beds and these needed to be level, so we shifted tons of soil from one side of the plot to the other and also used the surplus to fill the raised beds. I will come back to how well I achieved these objectives at the end of this post, but I started well. 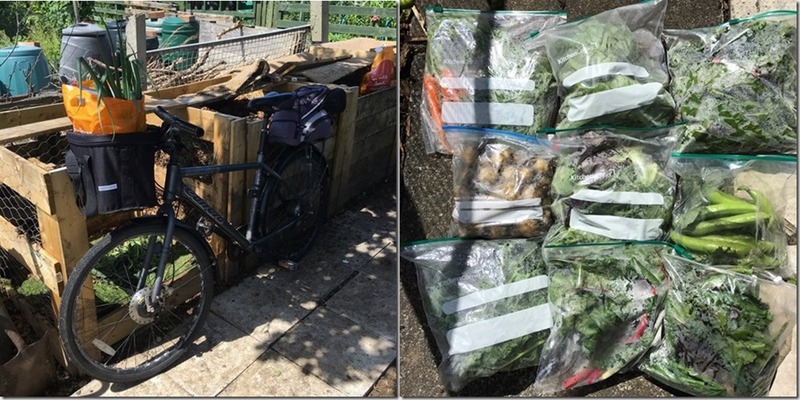 I got into the habit of cycling to the plot most days and one of the first tasks was to build my four compost bins, which rapidly filled up with a mix of weeds, rotten potatoes and apples from the plot, mixed with horse manure from the site bins. Even with three bins hot composting continuously I’ve still not been self sufficient in compost, but next year I should be. 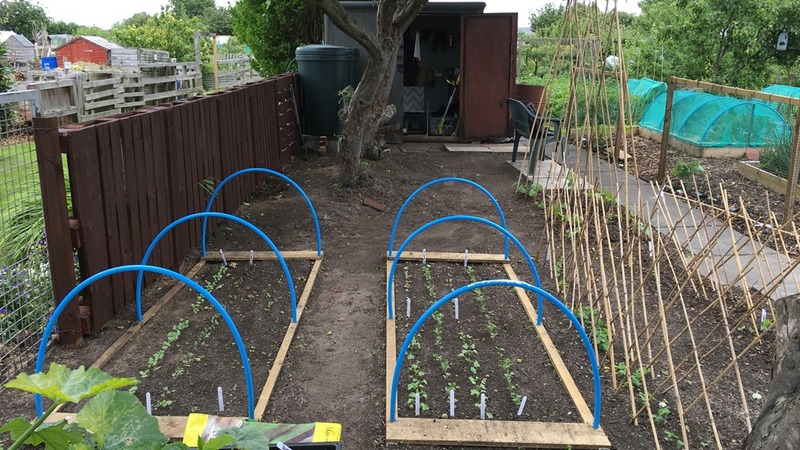 I decided against any large investments in sheds, greenhouses or poly-tunnels for a year or two, until I’d ‘earned’ enough money off the plot to afford them and learned more about my needs. 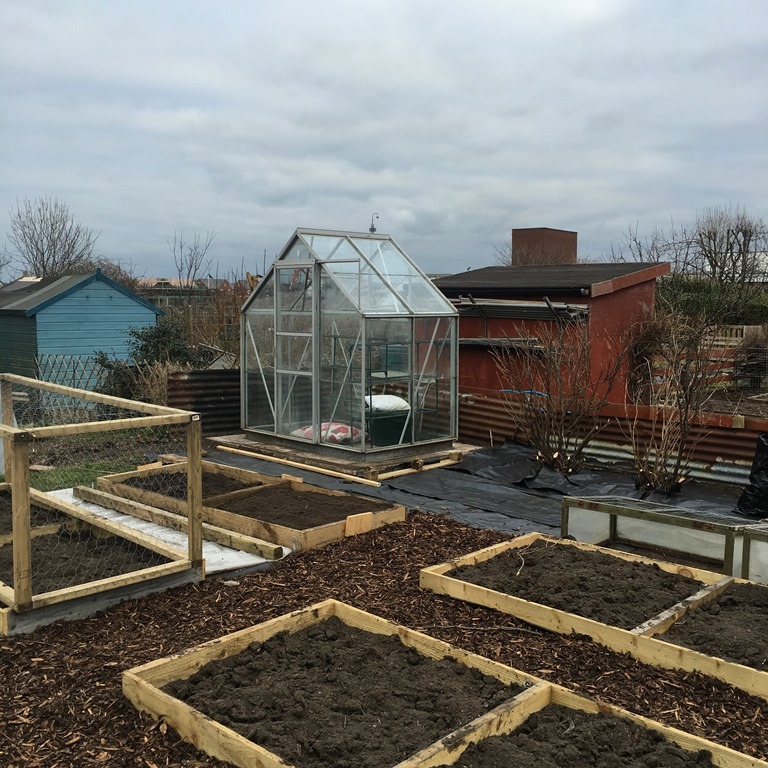 So we went for a simple grid design of raised beds, all of the same size and we moved a little greenhouse from the back garden. 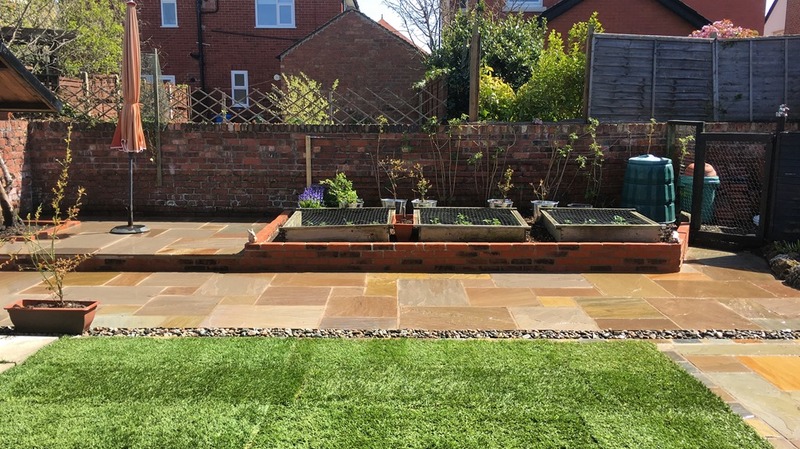 We quickly laid out the design, put down the paths and built the raised beds. 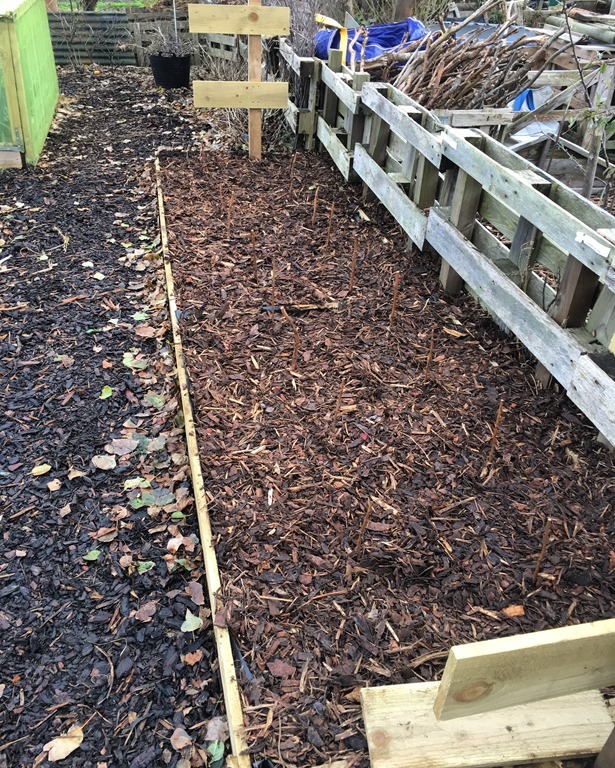 We filled the beds with a mix of existing soil, mushroom compost and well rotted horse manure with a sprinkling of well rotted chicken manure for good measure and we ordered 3 cubic meters of bark chips. Everything arrived in bulk and it was quick and cost effective to lay down. 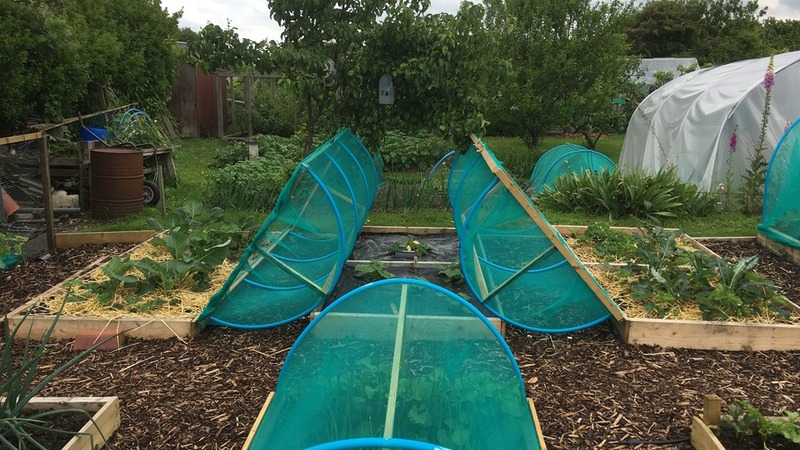 One of the first things I did after assembling the beds was to build these mini poly-tunnels, using water pipe and builders polythene (now replaced with UV stable poly-tunnel grade polythene). 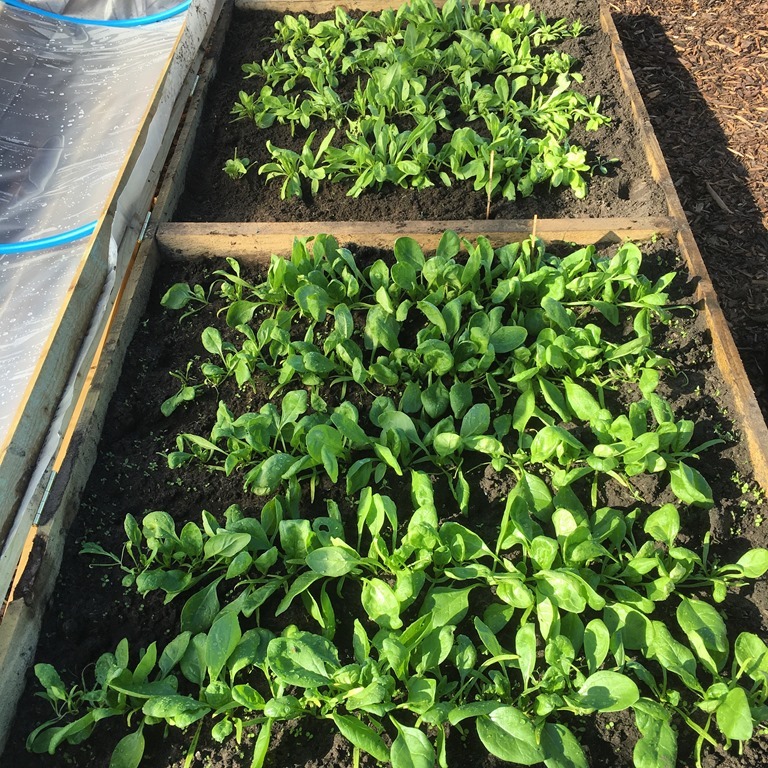 These were planted in March with a wide range of lettuces, oriental greens and spinach and by April we were self-sufficient in salads and feeding lots of friends and neighbours. The next job was to build the netted frames to protect the strawberries and brassicas. All of the frames are the same size, so it’s only a few minutes work to move a poly-tunnel or netted frame from one bed to another. 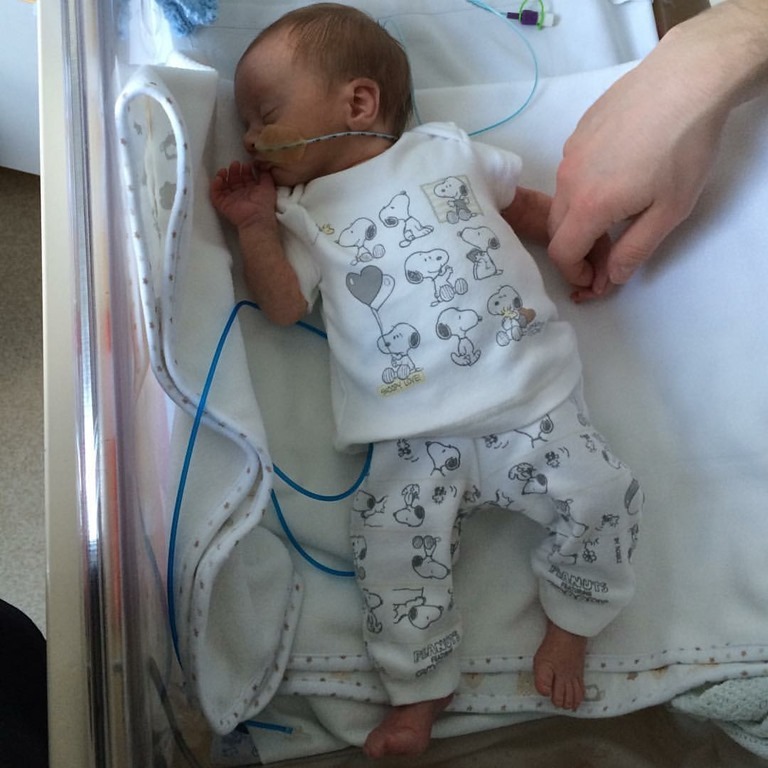 Jon had been helping me all this time, so progress was fast, but he and my daughter had their first (premature) baby at the end of March, so our priorities changed a bit, especially for Jon who swapped the allotment for the hospital for a few weeks. Fortunately everything worked out well and baby Robin is thriving and has visited the allotment many times, with his Mum and Dad, to watch the progress, which was now moving along at quite a pace as we started cropping in April. One of my projects for 2017 is to build him a play area, which is essential as I look after him three days a week! 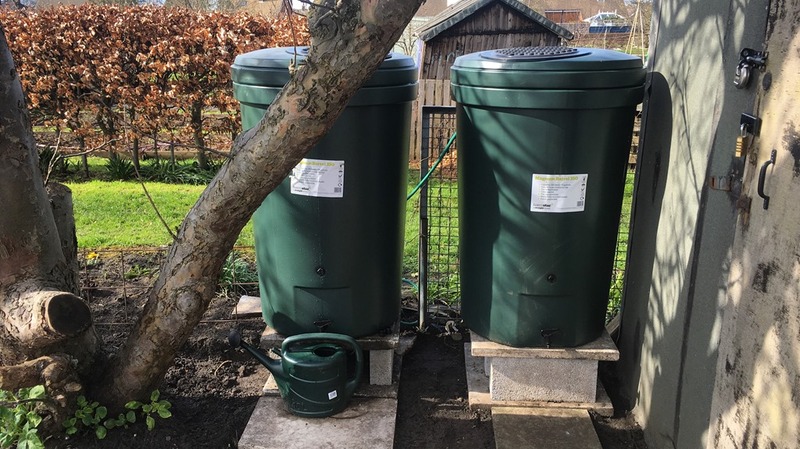 There’s no mains water on the allotment during late Autumn and Winter and with all of the frames and poly-tunnels I need a lot of water, so one of the top priorities was to get some serious water buts installed and eventually connected up to the shed’s new guttering. I now have three buts and they overflow into each other, they can be filled from rain water on the shed, or from the nearby tap. 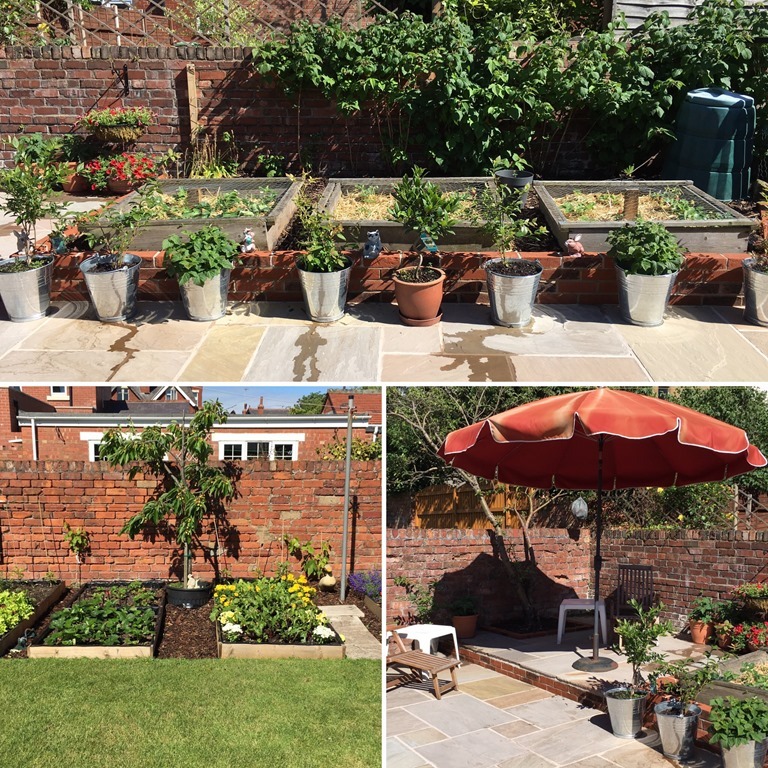 Back at home we were also working hard on the patio and fruit garden, which had been designed for convenience, with just enough food for snacks and for those emergencies when we didn’t make it to the allotment for a cropping day. The back garden was optimised for low maintenance as I didn’t want to have to come home from the allotment only to have another hour or more’s work to do here. I just wanted to enjoy a good book and the view from the patio, with a bowl full of garden fresh berries to eat. By May we were cropping half a dozen large salad bags every day and really rocking allotment life! 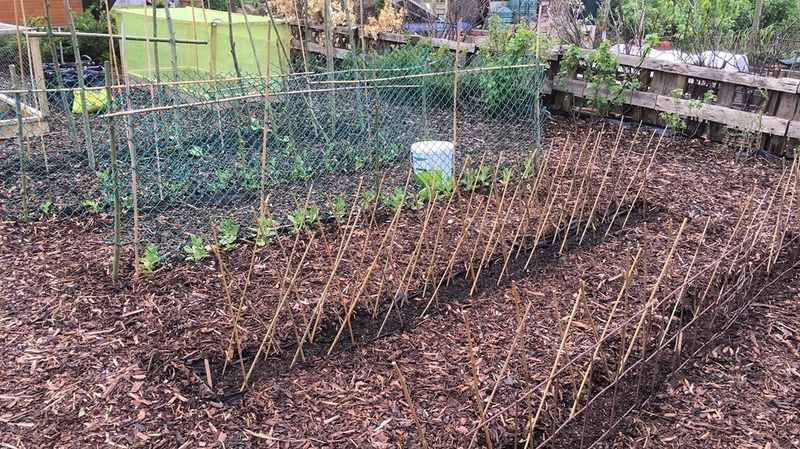 In May I also repurposed a tired old bed of raspberries to create a temporary area for peas and beans and this proved to be a revelation, I’d never eaten fresh beans and peas before, but I loved them. 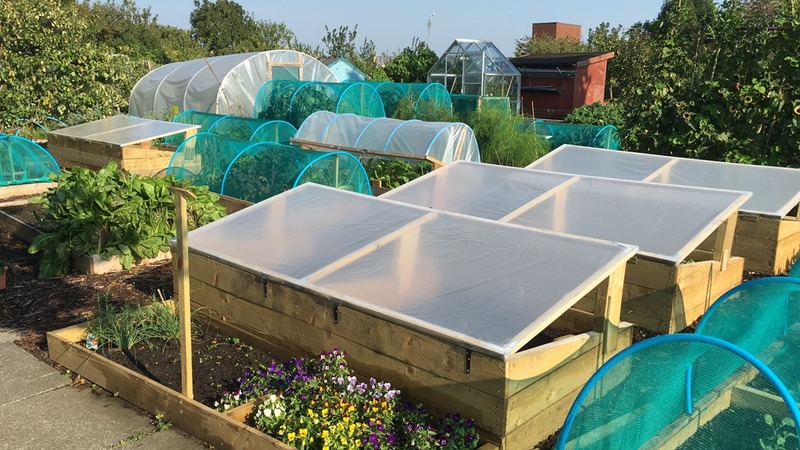 The mini poly-tunnels had been a great success, although I have now designed a new system that allows me to keep them fully vented in summer, this saves me the hassle of taking off the polythene and storing it. By June we were sometimes cropping a dozen bags a day and I had a second huge bike bag fitted, so I could carry everything home! 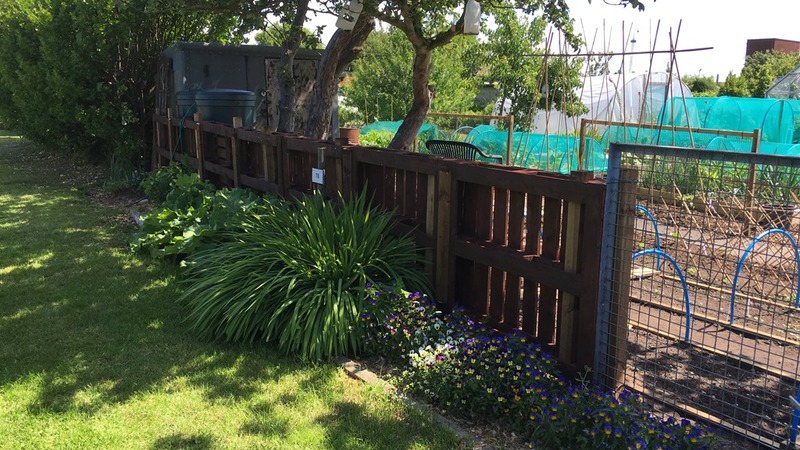 Mat, Jon and I also finished a pallet fence, that provided a nice boundary to the plot and created an extra decorative planting area. I finally cleared the area under the trees and created a set of new beds, planting directly into the original soil. This proved to be a disaster as nothing thrived and most of the veg ended up rotting or diseased. So this area has all new beds now and the apple trees have been heavily pruned so eliminate the shade. I also mastered the art of hot composting, which I found endlessly fascinating, it suits my impatient nature and the plot’s insatiable need for compost. 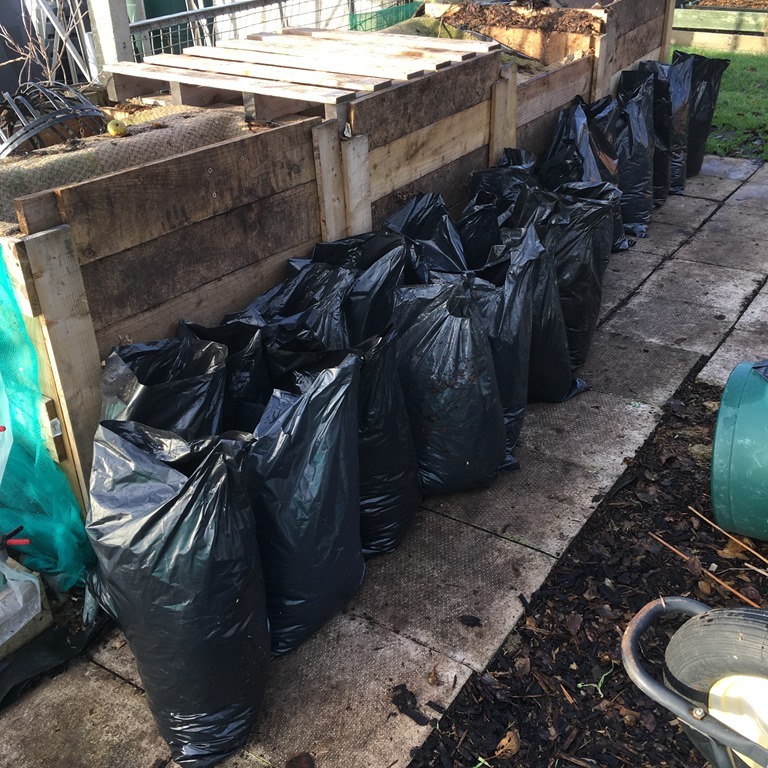 I’m using the no-dig method which entails applying a couple of inches of new compost on top of the soil each year and that means about 4 cubic meters of compost. 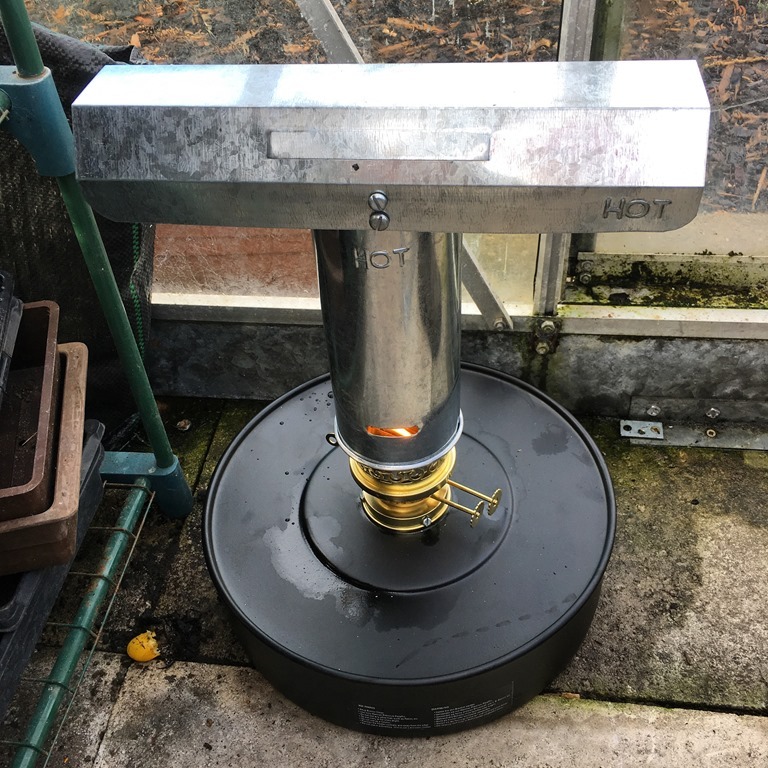 Hot composting is more efficient, more fun and better for the planet (less methane) and it’s great for heating water and warming up cold hands. By July our little kitchen and fruit garden at home was maturing nicely and I was also getting plenty of patio time, my daily routine had become: a cycle ride to Lytham in the morning to read at Caffe Nero, breakfast at another cafe with friends and then on to the allotment until 2pm, arriving home for an allotment grown salad lunch with berries on the patio, reading until 4pm and then making an allotment supplied dinner for the family – bliss. August was a predictably prolific time and by now we had so much more than salads and I was learning a lot about vegetables I’d never even eaten before, let alone grown, beans, peas and beetroot were the highlight for me, but Debbie loved these mini Butternut Squash and artistic veg photos! 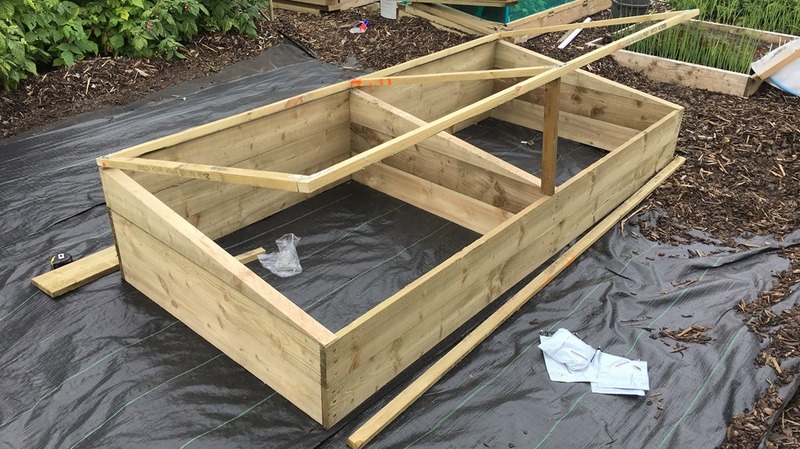 By the end of August I started to prepare for the Autumn and Winter, designing and building two hot bed frames and two cold frames. 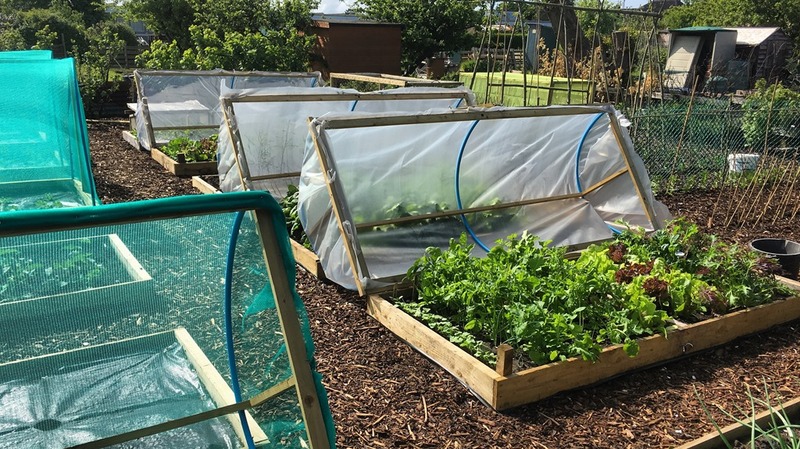 These frames were the same size as all the others on the plot, so it’s very easy to move the cold frame tops, poly-tunnel tops and mesh tops to any of the base frames. 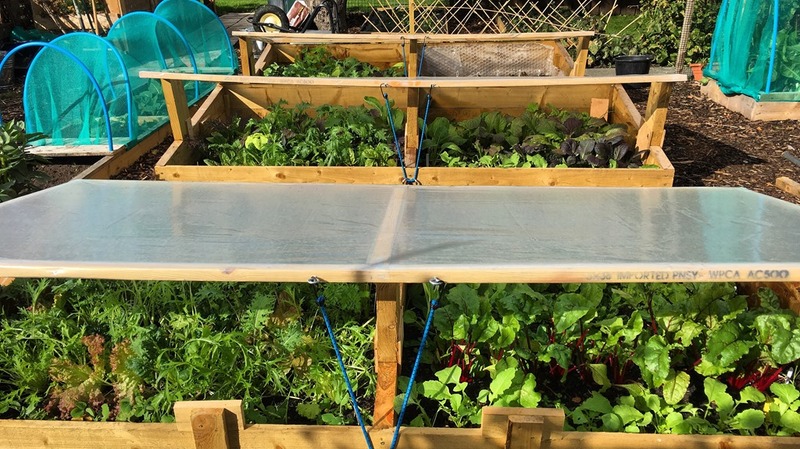 I particularly like the cold frames though because they are easier to manage on windy days and the tops unscrew for easy storage. 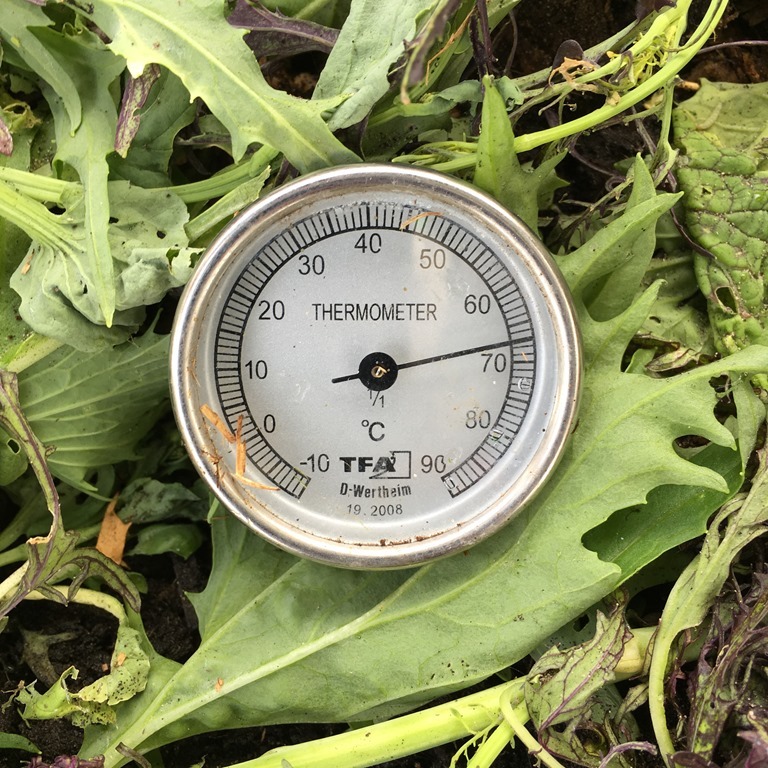 The hot and cold frames are essentially the same design, but the hot beds are dug six inches into the soil and have an extra frame on top of the soil too, providing a lot of extra depth for the manure. 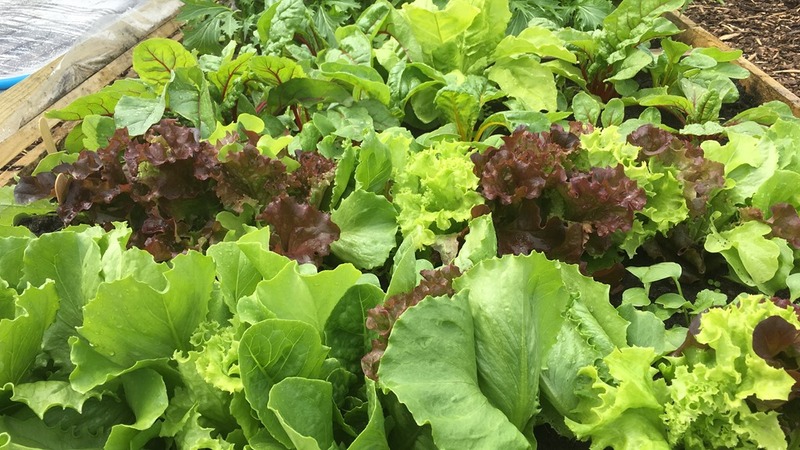 It’s September now and these cold frames have proved to be incredibly prolific and as I write this on January 1st are still providing all of our salad leaves and look likely to keep going until the hot beds take over in late Feb/early March. 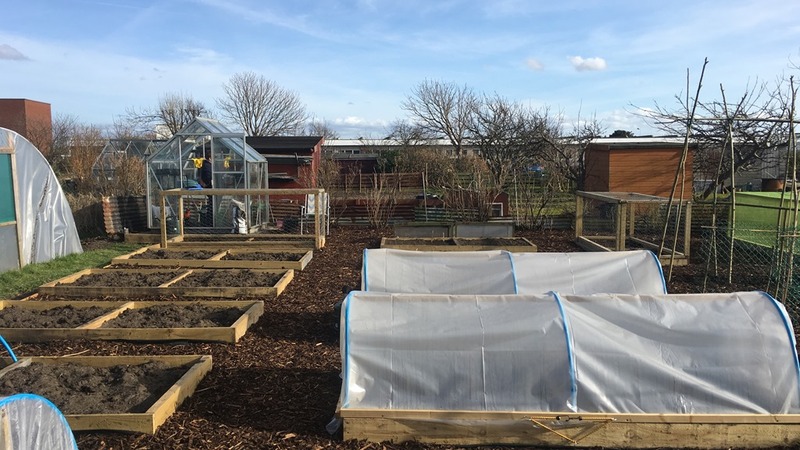 The next job was to build two large strawberry beds, to provide allotment snacks, these were planted up with runners from the much larger beds at home. I decided to grow most of my berries at home because they don’t transport that well. It’s October now and the focus is on preparing for next year so I’ve created a few narrow beds for beans, peas and winter brassicas, squeezed in by the side of the paths and two huge beds like the one below, this one is now planted with three different types of raspberry, designed to keep me stocked up with snacks for a full six months, the other bed of is for broccoli and sprouts next year, although it’s currently growing corn salad and broad beans. Even in December we are still cropping very heavily, although we are only meeting our own needs, the time of surplus is over. Apart from cropping my main focus in December has been growing seedlings for the cold frames and hot beds. I’ve started these under lights in the shed at home, but they end up in the little greenhouse, where I’ve invested in a small heater for those few frosty nights. 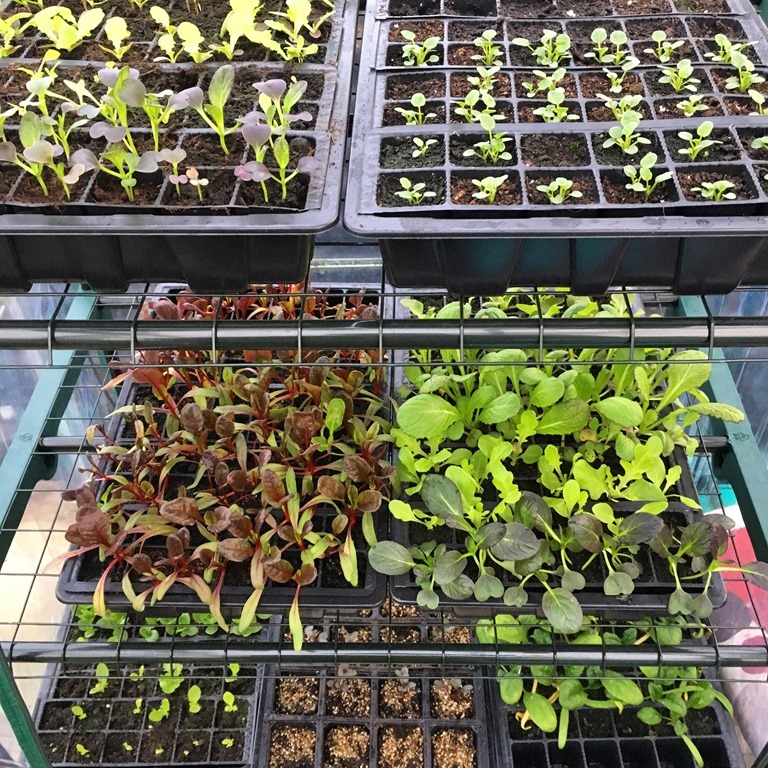 I’ve only had to use the heater a couple of times as the seedlings are in a mini-plastic greenhouse, within the main greenhouse, and I use fleece on them too, but they are doing splendidly so far, mostly dormant waiting to be planted in January in the hot bed. 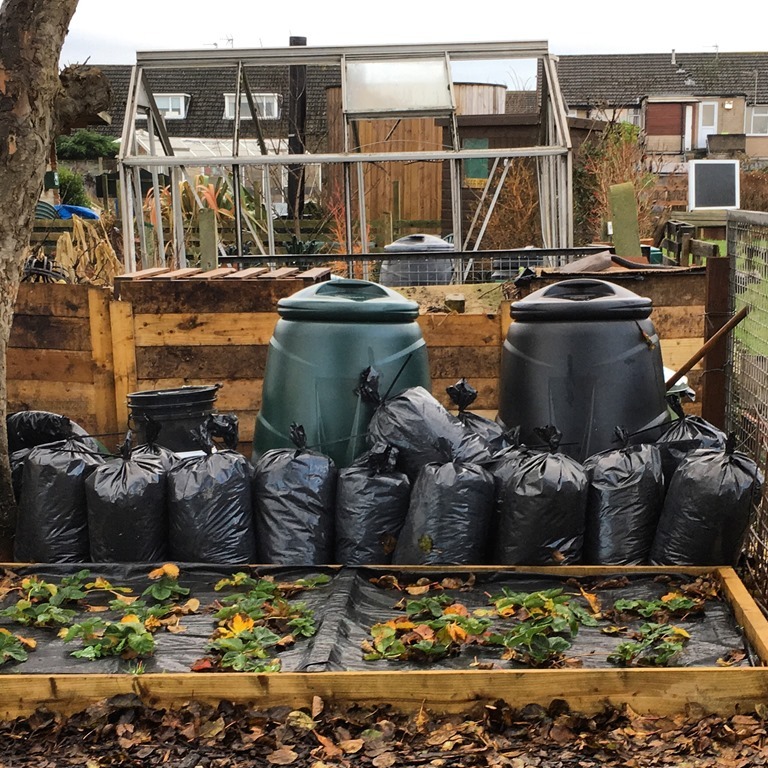 I’ve also now filled all four wooden compost bins and my two overflow plastic bins and bagged up a few leaves, all of the beds are topped with compost, so this stuff will be nicely rotted ready for 2018. 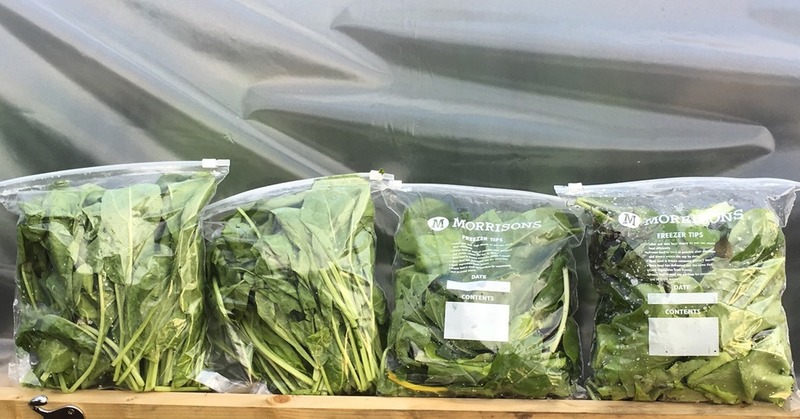 Finally as the year comes to an end I’ve bagged up the ingredients for my hot beds, horse manure, shredded leaves, rock dust and seaweed, all ready to go mid-January. I’ve bags of soil and compost as well to create the growing medium, but they are out of shot. 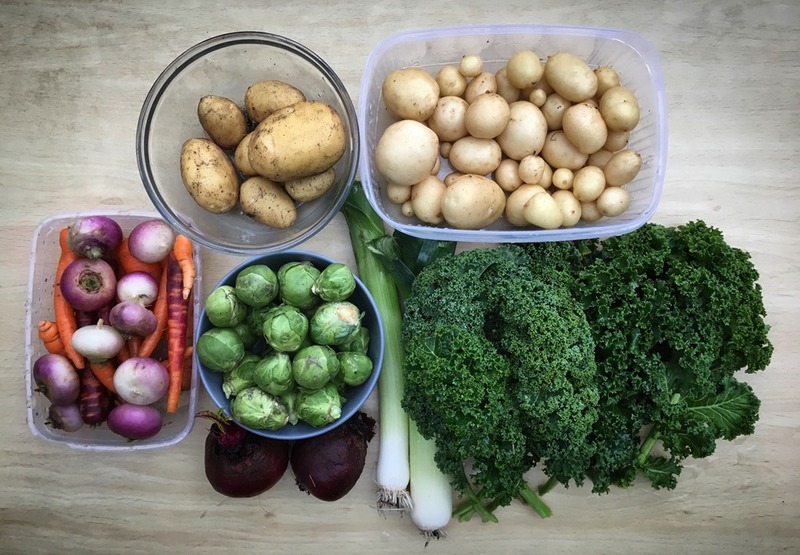 The Christmas Day crop was nothing special, we’ve been cropping like this every few days for months, but we are slowly running out of a few things now, I will do a better job next year, but I’m happy with my first Allotment year. We’ve grown most of what we’ve eaten, including dozens of types of salad leaves, kale, broccoli, sprouts, cabbage, potatoes, carrots, radish, tomatoes, leeks, spring onions, onions, chicory, beetroots, chard, spinach, turnips, runner beans, French beans, sugar snap peas, peas, broad beans, courgettes, cucumbers, butternut squash, strawberries, raspberries, blueberries, cherries, pears, cooking apples, eating apples, gooseberries, red and black currants, blackberries and lots of herbs. Most of what we’ve eaten has been fresh, although we’ve stored beets and potatoes, and frozen a few beans, next year we will grow, store and trade much more and also plant flowers. Looking back at my original objectives, how did we do? Levelling the site: we shifted tons of soil from one side of the plot to the other and also used the surplus to fill the raised beds, it’s been a great success, the level plot is more aesthetically pleasing, but more importantly it’s retained more of it’s own water and reduced flooding. Grow year round, and organic: I’ve not had to use any inorganic fertilizer or weed killer on any growing area, except a little around the backs of the fruit bushes where the bindweed was at it’s worst. 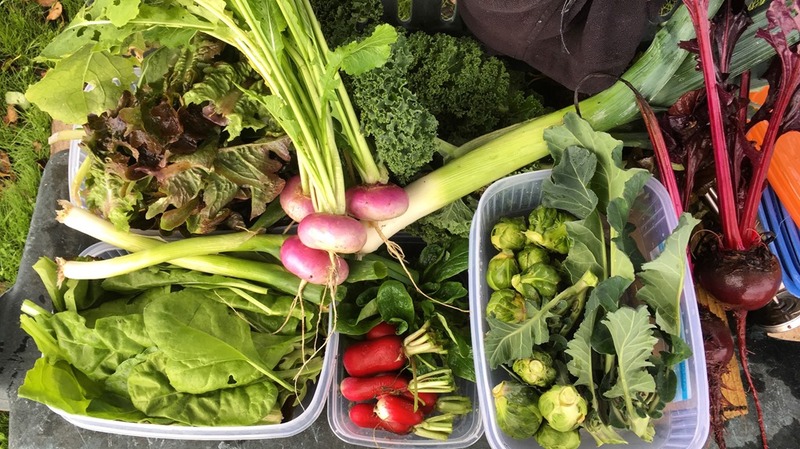 So far, as I write this in January, we’ve been growing all year and meeting most of our veg and some of our fruit needs from the plot and we eat a lot of veg! Next year I’m hoping to meet more of our fruit needs and time some of my veg planting better, so I have fewer gluts and more winter veg, picked and stored by winter. The raised beds and bark paths have been easy to work no matter what the weather and I’ve never even needed to wear wellies! Financially self sufficient: even though I’ve invested heavily in the plot this first year, I’m just about self sufficient, I’ve estimated that I’ve cropped at least 1,500 meals from the allotment, fruit for breakfast, big salads for lunch, steamed and roast veg for evening meals, berry salads for supper and lots of snacks, gifts to friends, family, neighbours and other allotmenteers. Assuming a conservative £1 per (organic) meal I’ve easily covered my costs. Next year I’m planning to spend much less as I save up for a shed and poly-tunnel. 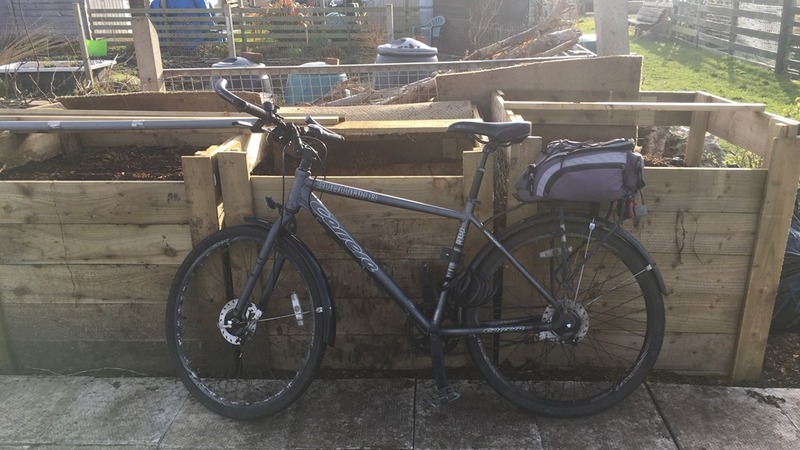 Get fit through natural movement: this has worked out great, cycling and walking to the allotment, working for a few hours with lots of lifting, carrying and stretching, walking around the site and lots of building projects have been great for my health, I’ve cancelled my gym membership! Ever since I was a teenager I’ve dreamt of living a simpler self sufficient life, as I grew older I learned to love modern conveniences and small town living too. I’ve grown used to an easy modern life and my health constraints mean that I’m unlikely to be able to run a small holding in the country. Living in a small town, close to the beach in one direction and the allotment in the other and cafes to either side has proved to be an ideal compromise. I get to live the good life, without having to turn my back on civilisation and convenience and without putting my health at risk by taking on too much – it’s perfect! I really enjoyed reading though your amazing progress last year, Steve. Thank you for sharing all this. We are also fairly self sufficient in veg and soft fruit throughout the year, but it took us a bit longer than you to get to this point!! Good growing for 2017 too!! Next story Should I Retire Early?